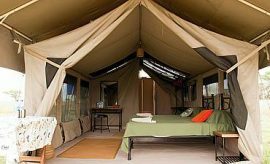 Lemala Ewanjan Camp is one of three Lemala sister camps in the Serengeti offering different views of the fantastic ungulate migration through this prized Tanzania National Park in search of fresh water and pasture after the frenzied breeding season around December-March every year. 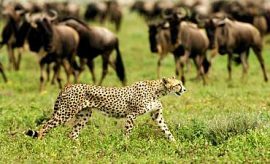 A safari in Tanzania gives you the opportunity to see herds of over a million wildebeest moving month by month from the southern savannahs through the western corridor, some via the central Seronera detour to the Maasai Mara and back to eastern Serengeti, accompanied by hundreds of Thompson's and Grant's gazelles and hundreds of thousands of zebras. These are followed by a vast number of opportunist predators waiting to pick off the old, compromised, newborn, the weak and the injured. 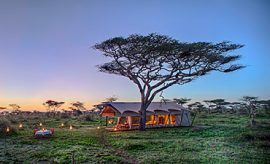 Situated on the western flanks of the Makoma Hills in Seronera area of Central Serengeti, Lemala Ewanjan Camp safari experience offers spectacular views of the migration. 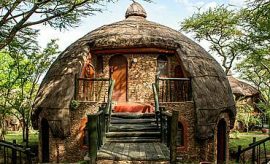 It is arguably one of the best sites to visit for this purpose during your AfricanMecca tour in Tanzania. 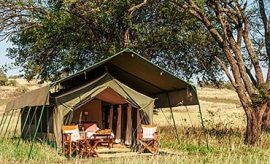 From this tented camp, you can access staggering numbers of wildlife on the move around April to June including abundant resident game that exists throughout the year. 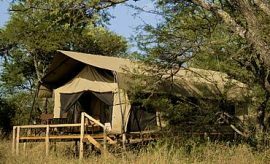 Although game viewing is the prime purpose of this camp, and indeed of your journey to Africa, you can be confident of excellent accommodations and service. 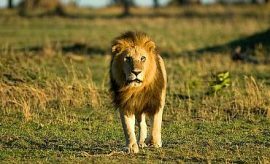 When you travel to Africa, it is essential to arrange wildlife strategic accommodation in advance of 6 to 8 months prior to arrival. 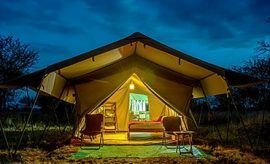 At Lemala Ewanjan Camp on your tour of Serengeti with AfricanMecca, comfortable and luxurious living quarters awaits you -- seven very large tents, each designed to provide a home from home for two adults and two children. There are wooden floors and leather beds in king or queen sizes, with warm duvets as it can get quite chilly at night. The ensuite bathroom is provided with a generously proportioned safari shower, flush toilet and running water. There are wooden cabinets, relaxing armchairs, solar lighting and a games table as well as an outdoor lounger. 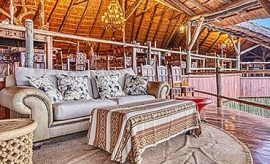 A stylish separate mess tent offers gracious living with well-furnished dining areas, a central bar and a well-designed lounge featuring leather sofas, rich rugs, graceful chandeliers, convenient side-cabinets and decorative storage chests. All meals include drinks, especially sundowners are enjoyed with accompaniments around the outdoor campfire before guests move to the relaxed dining area for a more substantial dinner. Enthusiastic staff are delighted to make you as comfortable as possible, and guides are passionate about sharing their knowledge of the area and its wildlife. Arrival transfers to your tent over the 25 minutes journey from the nearest airstrip is by 4x4s, giving you a preview of your safari in Tanzania and of the many animals that stomp the diverse landscape close to your camp. 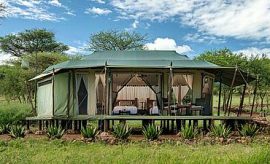 The Lemala Ewanjan bush camp is sited in the center of the Serengeti, and this ensures that you will be able to see prodigious animals no matter what time of the year you tour Serengeti. 4x4 vehicles, custom built especially for rugged land will be provided for your game drives, and are equipped with facilities for cooling refreshments and charging. AfricanMecca experienced, expert game guides aboard will regale and amaze you with stories of how the animals live and interact with the other animals and their environment. The guides also have the discretionary opportunity to be in touch with other guides over the radio to share matchless wildlife tracking information to maximize on your wildlife viewing experiences. When you travel to Africa during the wildebeest migration season or even when the herds have proceeded, be prepared to meet the Big Five of the Serengeti, the lion, the elephant, buffalo, the rhino and the leopard along with great many predators such as the wild dog, cheetah, hyenas and their prey, the many hoofed or horned herbivores from zebra, wildebeest, giraffe, elands, Grant’s gazelle, klipspringers, topis, impalas, hartebeests, and many more. Don’t miss the antics of the vervet or black and white Colobus monkey as it picks the leaves off a tree delicately with its mouth or grooms its colleagues with much reciprocity, or the male hippo opening his mouth wide to show off his canine tusks to impress his pool of females. Take a balloon safari for an eagle’s eye view of the majestic Serengeti over the kopjes, acacia trees, termite mounds and small lakes with their profusion of water birds including over 500 avian species inhabiting the terrestrial land supplemented with uninterrupted and non-intrusive big and small game viewing opportunities. 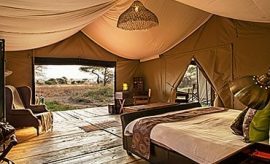 Come experience the Lemala Ewanjan Camp Safari with AfricanMecca and view a unique wilderness like no other on earth. A typical day of your vacation in Tanzania begins with a gentle introduction as your steward brings you a wake up tea or coffee. Dress and head out for your enthralling early morning game drive with your AfricanMecca guide; thereafter, returning for a full English breakfast cooked over coals, newly baked bread from a large camping oven combined with a fuller meal of fruit, oats, eggs, local cheese or freshly crisped waffles. 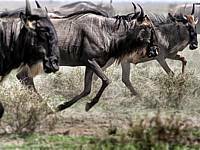 Whenever your guide learns of migratory herds in the area, he will take you out to follow them in the open or pop-up roof game-drive viewing vehicle, taking a picnic lunch with drinks and snacks along for refreshment. Flexibility is the key to getting the most out of your adventurous wildlife safari in Africa. 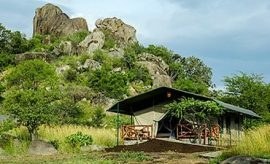 You can opt for a short guided walk around the camp area to be familiar with the camp flora and smaller creatures of nature before a lunch selection of prepared platters; indulge yourself in a hedonistic after-lunch siesta; relax over mid afternoon tea with fragrant warm rolls, and then take off in search of unique wildlife adventures as the afternoon turns in evening. 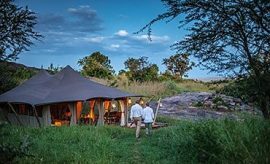 You can stay out for sundowners in some more distantly prepared view point with a make-shift bush bar and enjoy the change of light in the golden hour before the sun sets over the endless reaches of the Serengeti’s waving plains. Excellent wines, beers, soft drinks and fruit juices are available as well as superlative Tanzanian teas and coffees. The dinner hosting team may offer a choice, whether to dine in camp on superb soups, salads, roasts, vegetables and rich desserts, all prepared from wholesome, locally sourced produce, or to dine with live bush cooking underneath the stars in the tranquil beauty of the nightly sounds of the African bush – weather permitting. After all, you took your Serengeti safari for the chance to build memories you will treasure for the rest of your life. 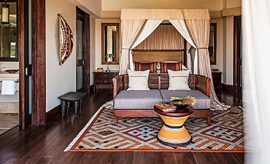 When staying at Lemala Ewanjan Camp in Central Serengeti (Seronera River Wilderness), we recommend combining it with your Northern Tanzania safari to Tarangire, Lake Manyara and Ngorongoro Crater. End your trip with a Swahili cultural tour and beach holiday in Zanzibar.